Having ionized and alkalinized water is essential to any household and with the Dragonn pH Restore Alkaline Water Pitcher you get exactly that. The jug truly lives to its name as you will surely notice an increase of at least 20% of Alkaline in your water. The ideal levels are between 7 and 9. Tap water in most cases comes at about a level of 5. There are a couple of things that really make this pitcher one of the best for that price. First of all, you are unlikely to have any problems with the filter replacement indicator. This little device is waterproof and will keep functioning properly. Most filter jugs in this class also go for a cool innovation such as an electronic gauge but they typically fail miserably at making it a good one. With the Dragonn pH Restore Alkaline Pitcher, you rest assured that your indicator is functional at all times. The water reservoir above the cartridge doesn’t allow any water to come out even when the jug is tilted. This is a nice feature as you can pour even when some water is still being filtered. The size isn’t huge and the water filter pitcher can easily be stored in a fridge. You can see our pitcher comparison here. The pitcher will not filter fluoride from tap water so this can be considered as a disadvantage. However, all other more popular contaminants are removed and let’s not forget the rise of the pH levels. Coming back to the alkaline topic, the filter will start working slowly after a short period of time. Many people get anxious that their filter is defective as it appears to be dying quickly. This is not the case, however. 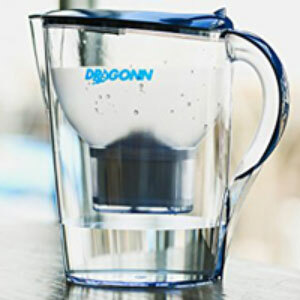 The filter contains crystals which ionize and alkalinize your water. With heavy use, those crystals stick together. What need to be done is to take the filter out and shake it firmly. This will cause for the crystals to break in pieces and the normal function of the filter will resume. Having to do that regularly, though, can definitely be flagged as a setback. One more action involving the filter is related to its placement. You need to press it hard when inserting it. 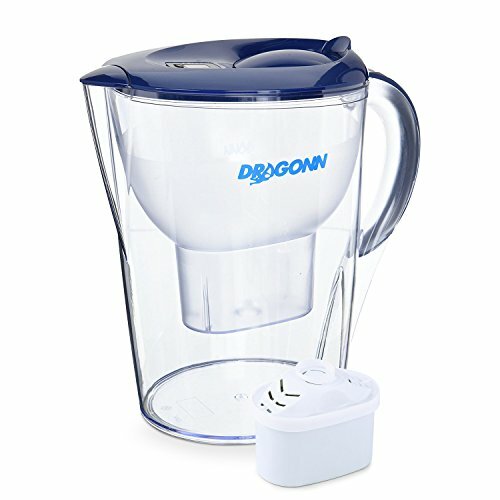 The filter of the Dragonn pH Restore Alkaline Water Pitcher needs to be well-snugged or otherwise some unfiltered water will leak around it and will end up in the bottom reservoir where the filtered water is. All in all, the jug doesn’t appear to be very well-sealed. Parts are often moving and create an impression of flimsiness. The lid might fall off when trying to get that last cup of fresh water and when tilting the whole unit too much. Some of the filter issues mentioned above are discovered by people throughout use. It would have been better had the instructions sheet been properly written. The manual does not contain any information regarding having to shake the filter. There’s also no FAQ section. When it comes to water filter pitchers, improvisation isn’t the best way to go. Effective – the jug does exactly what it says it does – ads alkaline to your water and raises pH levels drastically. Filter clogs – you need to take it out periodically and shake it so that it can unclog and work again.